As promised, here is one of the workouts I videotaped while visiting my in-laws in Belarus (near Russia). I was unable to make it to the gym regularly, but I wasn't about to miss training... especially considering how much food we were eating on this trip! Admittedly, there was plenty of alcohol consumption as well... at least more than I am used to. 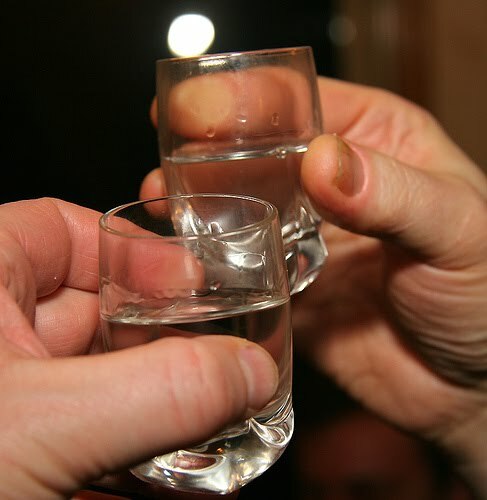 In fact, on our first night in Belarus my father-in-law, Valeriy, served us a couple of shots of his "special Vodka" to celebrate our safe arrival. Not wanted to disappoint him, I tentatively snapped it down in one shot. Within a second it hit me... literally sucking the breath right out of me! My face must have turned white because he quickly put a glass of water in front of me. Of course, I'm still trying to act "cool" as I casually sip the water, and whisper painfully "vkusna" (which means "tasty" in Russian). It turns out this stuff was moonshine and was 96% alcohol! No lie! Well that was the worst drinking experience, but not the last. I didn't understand most of what everyone was saying, but there must have been alot to celebrate because we were toasting with shots of Vodka at almost every dinner! Needless to say, I didn't want to miss my workouts on this trip! So I set up several simple, intense circuit training workouts using body-weight exercises, such as the workout I show you in this video. This is similar to the workouts used in the Systemic Endurance phase in my Get Lean program (check it out at Get Lean Book). Using exercises and a program like this you never need to miss a workout while traveling. If you're interested in the Power Wheel or Jungle Gym Straps, check them out at the lifts on the left of my blog. I have 2 more videos ready to upload from our trip, including a gym workout (demonstrating a great high-intensity training method) and my Russian sauna experience! Stay tuned for those next week. Oh well, a little bit of Russian moonshine never killed anyone. On second thought, it probably has at some point! Glad you we're able to "man-up" and represent for the fitness community! Just because we have great health habits does not mean we don't know how to party! Thanks for the vid - and the great story. coach Kaitlyn sure put you to work. Great workout. Very easy set up where we can all stay fit on the go. Thanks Jeff... and yes, she's the best coach I've ever had!